43 Inverness Street is proud to announce a solo exhibition by Saki Satom. 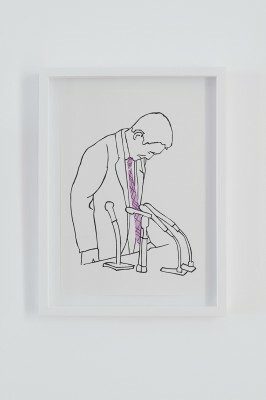 For her first exhibition at 43 Inverness Street, Satom is showing video works and drawings, which identify the constraints, awkwardness and freedoms of the individual in relation to society. 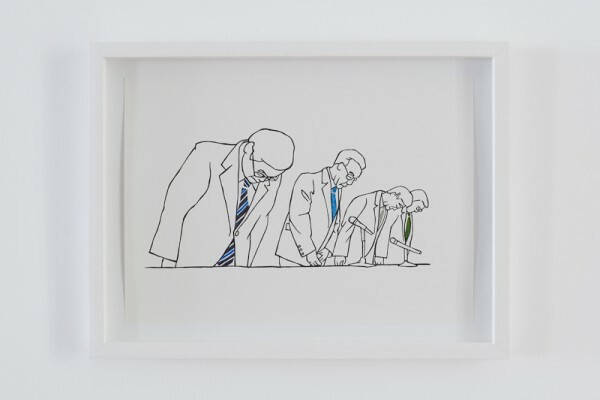 A series of ink and watercolour drawings on the ground floor, Apologies (2009-2011) represent Japanese political figures and businessmen performing the rites of public apology. Inscribed with constraint, these public offerings are a high-theatre of disgrace. 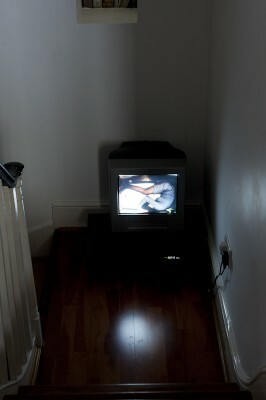 Also on the ground floor are 4 videos from the series Greetings, 2005. Shown on a single monitor with headphones, the videos are interviews with a variety of experts, which include a protocol advisor and an anthropologist. They discuss the subject of the etiquette of greeting: How and when do people kiss? Who kisses, who doesn’t? At the core, the discussion reveals the shifting cultural boundaries of the social contract. On the lower landing, Satom’s A Space of One’s Own (2003) is installed. In the silent single screen video, a woman spins, kicks and struggles in a stainless steel tub, which seems embedded inside the monitor itself. Her frenetic action at first seems a struggle to escape, but over time the frame might be thought of as the field for a type of limited creative freedom. The work portrays the essential relationship between constraint and creativity. Upstairs, two videos shot in the halls of the Tokyo subway give contrasting perspectives on the dynamic relationship between the individual and the group. Satom’s M Station Backwards (1998) uses the reversal of video time to perform an opposition to the restrictions of convention. The protagonist mysteriously moves contrary to the flow of commuters. Is this protest for emancipation or a simple trap of non-conformity? In M Station Run(1997-98), Satom highlights the herd behaviour of crowds in the subway –by joining them. Commuters seem drawn by a force of nature to sprint down hallways. Through repetition, rhythm and noise, the run becomes an act of expression and life. Saki Satom lives and works in London, England. She has shown at Tate Modern, London, and at the Museum of Contemporary Art Tokyo. Her recent solo exhibitions include Alternative Stories, Taigh-Chearsabhagh Museum & Arts Centre, Scotland in 2009, and Saki Satom at Gasworks, London in 2005. She has had residencies at Delfina Trust, Camden Arts Center, and at De Fabrik in the Netherlands. She holds a PG Diploma and MA in Fine Art from Goldsmiths College, London. 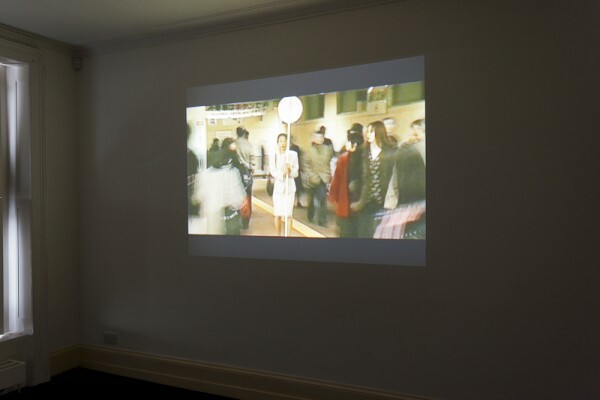 43 Inverness Street is an art gallery within a private home. 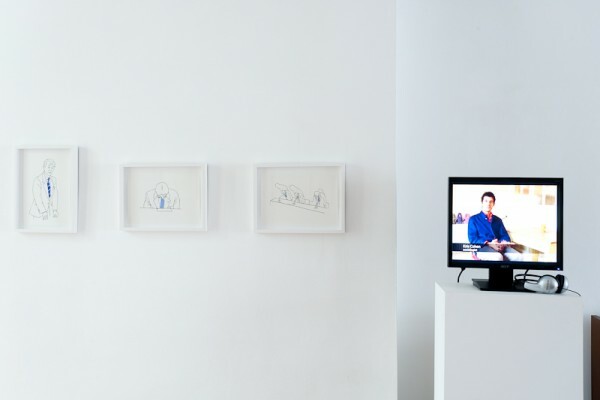 It is conceived as an accessible, intimate space to present challenging exhibitions of contemporary art.